A comment on Reddit got me thinking… because the quick and simple answer is: NO!! Yet someone had got a rather different impression of me and what I thought of Sound Devices, and I replied back with what ended up being a rather lengthy and long comment indeed on Reddit! Thus I thought it is worth it spinning off to form this blog post as well. Probably also because there is an awful lot of negativity around Zoom, which is totally applicable for their H series but is wrongly justified in attacking their F series. And in the process of my defense I might come of as “too negative” of competing brands. I believe *ALL* equipment that Sound Devices has made from their first MP-1 to their latest MixPre10T are very very fine machines. But everything needs to be viewed in the context of their time, and in today’s marketplace vs the competition, and in terms of a person’s needs/wants. For instance do I think the Sound Devices 552 makes any sense whatsoever to buy at its current brand new price? OH HELL NO!!! (you could buy a 633 for less than the cost of a new 552!) Do I enjoy my 552 that I own myself? Yes I do. Would I recommend anybody buy a 552 secondhand today? (they’re commonly listed for over US$1K, but can be found also for a little under US$1K without too much trouble) Nope! Only in very niche scenarios might it *maybe* make sense (or if you find an utterly crazy bonkers good deal! ), I reckon they’re overpriced on eBay vs the options we have today in 2019. But did a 552 make sense for at that point in time those years ago for the price I paid? It certainly did! I do feel that way about most of Sound Device’s older products: 552/442/744/722/702. They really need to sell at more like half (no, a third!) of their typical going prices before I think they make sense in the context of 2019. As for 9 out of 10 people it makes no sense for them to pay more for a secondhand 744 than it costs to buy a brand new Zoom F8n! Or to pay more for a 702 than a F8 is on sale or secondhand. The MM1 (great for a boom op! ), MP1 (handy little thing to have in your tool kit), MixPre/MixPreD/302 (useful if you’re still doing a lot of old fashioned directly cabled to camera stuff on small shoots, but still… I’d be inclined to say just get a Zoom F4? ), 788T (but it is a tough ask to want to spend double what a new F8n is on a secondhand 788T, however it might make sense for some people. I think it is a close call as to if I should even include the 788T in this category as I still feel the 788T’s eBay price is over inflated, but it is at least a more reasonable proposition than say paying for an overpriced 702 which will fail to even meet the needs of many modern 2019 productions), and 664 (which can be found at a big discount to the price a 664 goes for new, which brand new I feel is too closely priced to the newer 688). But it depends so very very very much on context. Is it a brand new college grad? Then the 970 would be an **awful** choice for him! Or even a 688 would likely be very wrong. While a 633 would be wrong for many one man bands who are operating a camera as well, and should instead be considering a MixPre3 (or MixPre6). As I feel the MixPre3 is a wonderful recorder to pair with a camera such as a Fujifilm X-T3 or Nikon Z6 (or any of the many other popular mirrorless cameras out there to film with)(. 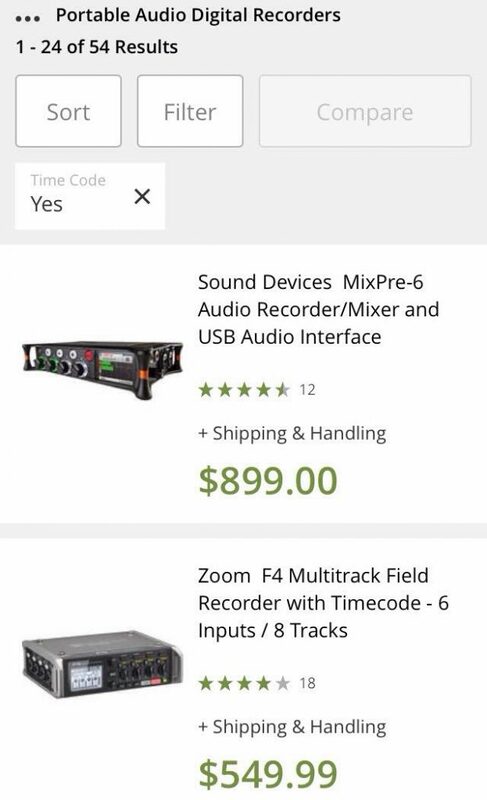 So circling back around to the topic which started this, I’m usually always recommending a Zoom F series recorder if the assumed context is they’re a newly starting out production sound recordist seeking their first ever recorder (or if not their first *first*, it is an upgrade from something way worse like a sub $300 Tascam or a Zoom H series or such). So in summary, I think all of them are great products which Sound Devices has ever made, but if you’re starting out trying to build a small sound kit then in terms of their price (especially their older products with their still high eBay prices, but is even applicable to their latest line up as well) for many people it doesn’t make sense if you’re wanting to get great value for money for your very small and extremely limited budget compared to the alternatives we’re spoiled with in 2019. However, I still see it as highly likely I’ll own a 6 series in my near ish future (but I’m waiting to see first if a 2nd generation 6 series product will happen! Such as a “Sound Devices 666”? Haha! But my wild guess is we’ll instead see a new “Sound Devices 8xx” series come out next). 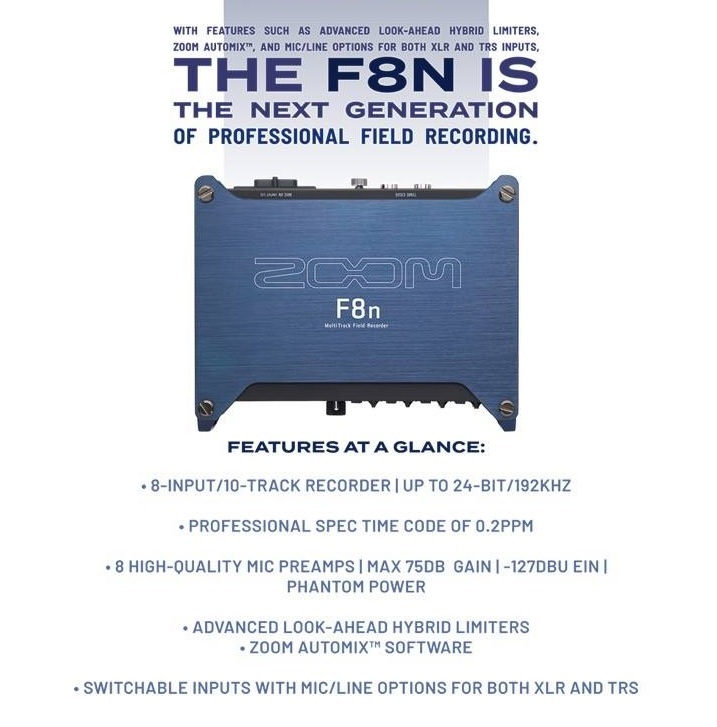 Currently I am very excited about the brand new Zoom F8n which just got announced, as you can see from the blurb it has some amazing specs, all for only US$999! (same price as the original F8 at launch, and cheaper than the indicated US$1200 when Zoom announced at NAB 2018 that a F8n was in development) However not everyone seems to be as happy about this as I am. The F8 original has had three years of excellent support from Zoom in updating it. I feel that is a perfectly reasonable level of support, better than that even! Plus there is the possibility the F8n has a more powerful processor in it than the F8?? So maybe the F8 is not even physically capable of all of the software features of the new Zoom F8n? Currently the F8 is at firmware update v4.10, that is a *lot* of updates! Those are some big BIG UPDATES there! And that isn’t even all of it from the v2.0 firmware update. Backing up / loading saved settings. Adding a TONNE of extra functionality to be used with the new FRC-8 and a keyboard. Again, another big BIG update. And this is not even counting the many smaller updates between the big updates, which further improved the F8 during its lifetime. I feel buyers of the F8 when it came out have been served very very well by Zoom, and I can only hope I get a similar series of updates during the lifetime of the Zoom F8n! 😮 I wonder what the future holds for the F8n? I certainly have some hopes for Zoom F8n which might still come to pass. Seems like it was only yesterday that I was unboxing the Zoom F4. 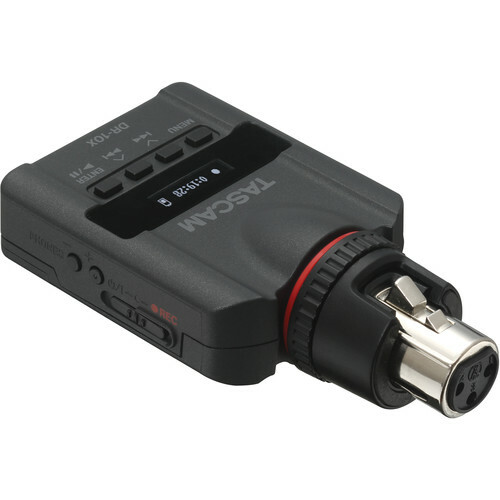 But actually it was in late 2016 when the Zoom F4 was announced (and I very shortly afterwards purchased, been a great upgrade from my previous Sound Devices 552 / Tascam DR680 combo). Now for news at the opposite end of the pricing spectrum (almost tens times more expensive!) 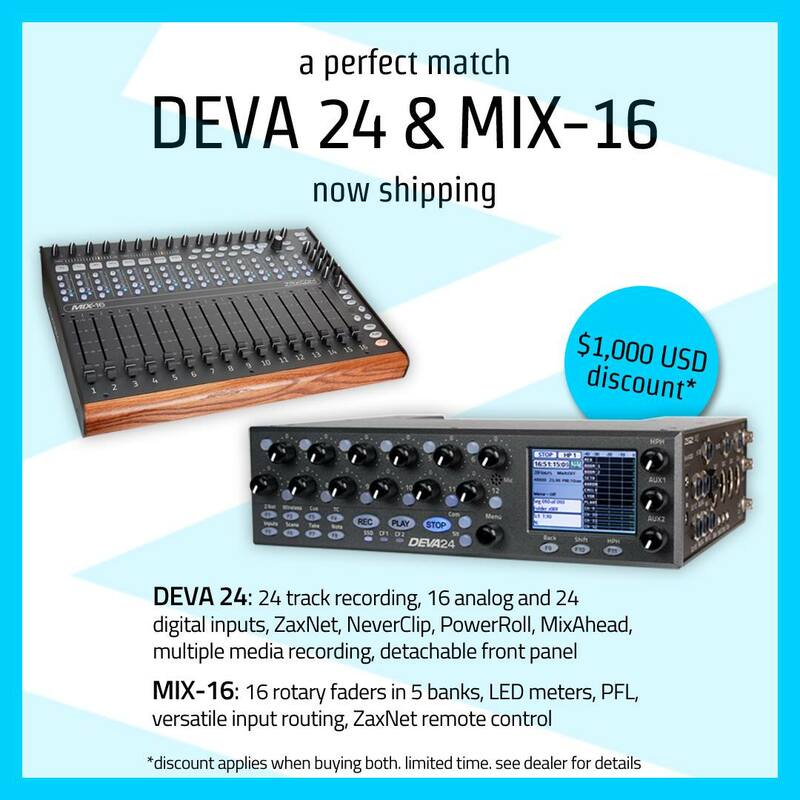 to the Sound Devices MixPre10M announcement today is the news that finally the Zaxcom DEVA 24 & Zaxcom MIX-16 are in stock and shipping! After what feels like YEARS of Zaxcom teasing us this coming. 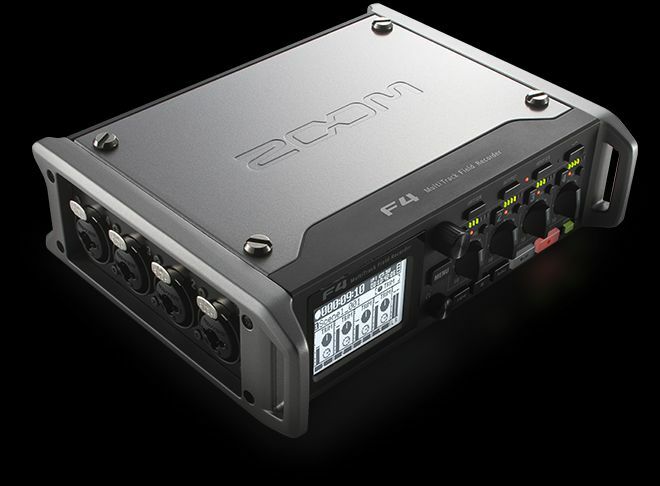 With a retail price of US$12K for the Zaxcom DEVA 24 recorder this won’t be for everyone, rather will be competing against the likes of the Sound Devices 688, Sound Devices 970, Aaton Cantar X3, and others. But not directly competing though as the DEVA 24 is Zaxcom’s own take on this, the DEVA 24 is itself quite unique from those others. Based on its Academy and Emmy award-winning predecessors Deva 24 can record pristine 24 track audio and has a plethora of advanced features including flexible input/output routing, ZaxNet™, NeverClip™, PowerRoll™ and MixAhead™. Deva 24 provides 16 analog inputs, 12 of which are switchable mic or line level with adjustments for high pass filter, limiter, input delay and 48V phantom power. Four additional line level inputs can be used as returns. Thanks to NeverClip™ preamps, it offers a staggering 136 db of dynamic range. Digitally, 24 inputs channels of AES are available on the unit, 16 support AES42. Deva 24 also accepts any unlocked AES signal with a sampling rate of 32 to 192 kHz. 10 output busses offer routing versatility through four XLR, three TA-5M and three 3.5mm connectors. Outputs feature delay settings, level attenuation and assignable output names. Audio can be recorded to three media simultaneously. An internal 2.5” SSD (1TB max capacity) is the primary media paired with two compact flash (CF) card slots. Files are recorded as MARF II, a lossless fault tolerant recording format to the internal drive and as Broadcast Wave files (BWF) to the CF cards. An eSATA port provides an external hard drive (SSD or HDD) option that takes the place of a single CF card slot. Deva 24 has an integrated mixer where 12 rotary faders can be assigned to act as a fader, input trim knob or a ZaxNet™ control knob. The rotary encoder allows you to adjust the compressor settings, input trim and invert the phase of an input. 8 tracks provide an infinite mix of all Deva 24 inputs, while 16 tracks are dedicated to ISO routing. Any of the 16 analog or 24 digital inputs can be assigned to an ISO track as either pre or post fader. Users of previous Deva systems will enjoy the familiarity of its design and intuitive software. Deva 24 has a detachable front panel interface and a touchscreen menu system that’s fast, easy to learn and extremely reliable for any type of audio workflow. It also allows you to connect a compatible MAC or PC to control it remotely via a USB cable. Combined, the Mix-16 control surface is a versatile extension for Deva 24. Featuring 16 motorized faders in five banks, any combination of analog or digital input channels on the Deva 24 can be assigned to the Mix-16. This provides sound recordists with an integrated recording and mixing solution capable of solving many audio challenges. Each fader on the Mix-16 has a bright LED input meter and the control surface is equipped with a pre fader listen (PFL) monitoring system that allows you to listen to channel audio before the fader is closed. It also has the ability to control the ZaxNet™ remote control function of Deva 24. Zaxcom’s Deva 24 and Mix-16 are available now. Receive a $1,000 USD discount when purchasing both before April 13, 2018. This new technology and more from Zaxcom will be on display April 9-12 at NAB Show in Las Vegas, Booth C3927. For existing MixPre-6 and MixPre-10T users: Sound Devices will soon be releasing a studio-grade Musician Plugin adding a new dimension of recording capabilities to the already versatile devices. For US$99, the Musician Plugin will feature all the musician-inspired features, including overdub, track laying, reverb, metronome and more. The MixPre-10M retails for US$1499 and will be available in late March. As while I’ve been very happy with my F4 recorder, I am thinking later this year (or perhaps next year) I will be upgrading from it. And the MixPre10T has been one possibility I’ve considered (along with a new 633 or 688, or a secondhand 664 or 788T. Or even from another brand such as Zaxcom or Sonosax). So is this MixPre10M is simply just a MixPre10T without an internal timecode generator? (just like how the MixPre6 & MixPre3 also lack it) As if so it could be a sweet way to save US$300, if you already have a timecode box to use with it (or even you could easily buy one for less than US$300, they’ve become amazingly affordable lately!). But it seems timecode in (no timecode reader whatsoever), metadata editing, Wingman app, and camera return are all a bit crippled in some manner or another in comparison to the MixPre10T. Oh well, that 100% killed my interest in the MixPre10M as (slightly) cheaper alternative to the MixPre10T. No surprise though, as it is targeted at musicians. And it is easy to see the appeal for musicians, if you’re not intending to do any sound for picture with your new MixPre10M. However, this is still overall good news for users if Sound Devices are expanding their user base. As this will help support further firmware development in the future for all MixPre users by bringing down the per user cost for development (so long as they keep the base firmware the same across all the new MixPre models, so it is easy to migrate improvements for one model across to all the others as well). I’m a bit surprised at how Sound Devices has managed to out sell Zoom, even with their much higher prices for Sound Devices recorders. The MixPre6 is DOUBLE the price (when you factor in a TC box purchase) of the Zoom F4 (even though the MixPre6 with TC in the bag, only has four input channels vs the six of the F4). The MixPre3 is even outselling the MixPre6! (MixPre3 is even out selling the F1!) Which I suppose makes sense as the MixPre3 is the cheapest of them all, but makes no sense to me personally as the MixPre3 isn’t “that much” cheaper for how much more crippled its functionality is?! Maybe the ultra miniature form factor is proving to be very popular. Likewise the MixPre10T which is well over DOUBLE the price of a Zoom F8, yet the MixPre10T is also out selling the F8. Guess this is why Zoom has recently put price drops on their F8 & F4! As even though I feel Zoom is out competing the low end Sound Devices when it comes to features and price, the market is speaking that the price gap needs to be even bigger if Zoom wants to out sell Sound Devices’ low end MixPre recorders. Surprising indeed the Tascam DR701D is next on the list when the F4 is only $50 more to get (didn’t expect Tascam to be so high), but I presume this sorting by “Best Sellers” includes ALL historical data (which only makes the newer MixPre rankings even more impressive? As they came out after the F4/F8), thus perhaps the long ish time the DR701D has been around is what has helped push up its total sales volume. Sound Devices 633 is next on this sorted list, no surprises here? As it would be easily Sound Devices most popular recorder ever, before they brought out the new MixPre recorders. 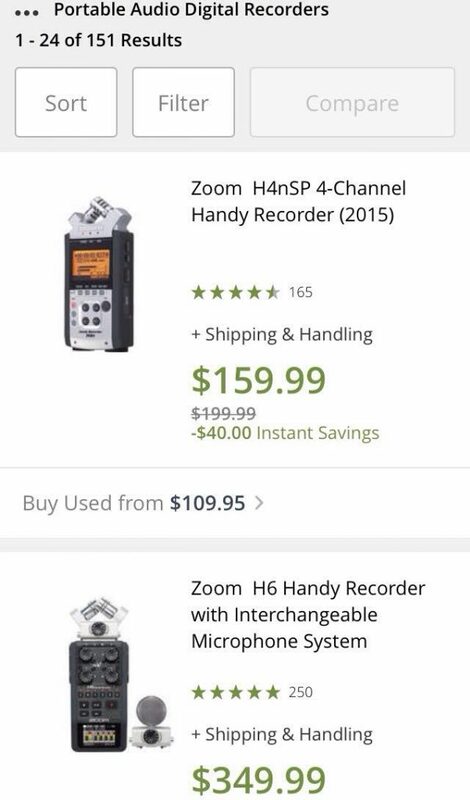 Sadly the original Zoom H4n is the most popular recorder of all for sale?!?! :-/ Terrible. Shows how slow people can be in moving on, and instead rely upon old chinese whispers of advice. Interestingly Tascam DR10L is #3, glad to see that is being widely picked up in the low budget world perhaps? And understandable why Zoom wants to then get a piece of that market with their Zoom F1. We ALL have recorders which record to more than one piece of media at once (for a safety back up), thanks to the dual card slots in the F4/F8. Anyway…. I hope Zoom could implement this feature to mirror files (or rather, whole folders! 😀 ) at the end of your day. And if you considering ones priced above those last three…. you’re surely doing this full time as a sound recordist and getting a healthy income from that, so why are you asking us here on Frugal Filmmaker? ha! 😛 But yes, tonnes and tonnes more options exist at the higher end as well! Finally, if you’re considering something in the budget range within what I just covered, but isn’t one of those that I mentioned, then it probably is *not* a good idea to buy if you’re intending to be a location sound recordist. Something else only might *maybe* make sense if you’ve got in mind some other purpose for it, such as perhaps you want to record a band in a studio (which has very different needs / constraints), or you’re the rare exception which proves the rule, or you are getting lucky finding some amazingly priced deal which can make an otherwise bad purchase decision then make sense if “the price is right”. For instance I didn’t include the Roland R88, as I feel it is extremely poor value for money in 2017! However…. there was a time at the end of 2016 when the Roland R88 got a huge price drop because it was being discontinued. Even with that massive price drop, the Roland R88 probably still wasn’t a smart purchase vs the Zoom F8, but the big drop in price at least made the R88 a somewhat competitive option worth mentioning in a round up of all the various choices. However, that sale is now long since ended, and the prices I see on eBay for a Roland R88 is even higher than what you used to be able to buy it new from B&H Photo! Clearly those eBay sellers are dreaming. Anyway, that was just one example which might have been applicable but isn’t now, so I don’t rule out the possibilities of something like that perhaps popping up again in the future especially if you very keenly look around for secondhand deals. But for over 95% of people reading this, that won’t be applicable, and just stick to going with one of the main ones I mentioned earlier.